He had the hunger for victory and found the rhythm at the right time at the Axiata Arena in Bukit Jalil, Kuala Lumpur and Chinese legend Lin Dan was crowned the men's singles champion for the second time in the Malaysia Open which ended on Sunday. 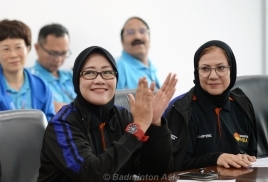 For the record, except for the women's singles final which was between Tai Tzu Ying of Chinese Taipei and Japan's Akane Yamaguchi, China featured in all the other finals of which the mixed doubles and women's doubles were also all-China affairs. The men's doubles final saw China's second seeds Li Junhui-Liu Yuchen dethrone defending champions Takeshi Kamura-Keigo Sonoda of Japan 21-12, 21-17 in 42 minutes. Lin Dan also won the Malaysian Open title in 2017 - defeating Lee Chong Wei in the final in Kuching. After a string of disappointing results, Lin Dan savored victory in his own way. As soon as he won the final point Lin Dan went down on the court and a shed a tear for his success. 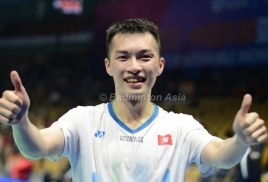 "I hope this nightmare ( a spate of recent disappointing results) had been put laid to rest by winning the Malaysia Open. "Determination and hunger for victory were the key factors for my win in the Malaysia Open," said Lin Dan who last tasted success in May 2018 when he won the New Zealand Open. The Lin Dan everyone knows - a two-time Olympics winner (in Beijing 2008 and London 2012) and a five-time world champion - showed his badminton skills and craftiness that often left Chen Long dazed. And the three big names in the world badminton hogged the limelight at the men's singles prize giving ceremony when Malaysia's former world No 1 and 12-time Malaysia Open champion Datuk Wira Lee Chong Wei presented the mock cheques to Chen Long and Lin Dan. Meanwhile, world No 1 and top seed Tzu Ying clinched her third successive women's singles title with a 21-16, 21-19 win over fourth seed Yamaguchi. Despite the defeat, Yamaguchi will go down in history as the first Japanese player to play in the women's singles final. The mixed doubles saw world and All-England champions, top seeds Zheng Siwei-Huang Yaqiong defeat compatriots and second seeds Wang Yilyu-Huang Dongping 21-17, 21-13 for the title USD51,800 in prize money. Chen Qingchen-Jia Yifan took the women's doubles title with ease - a 21-14, 21-15 win over compatriots Du Yue-Lin Yinhui in 37 minutes to make up for the defeat in last year's final.